Brass; beaten and inlayed with silver. 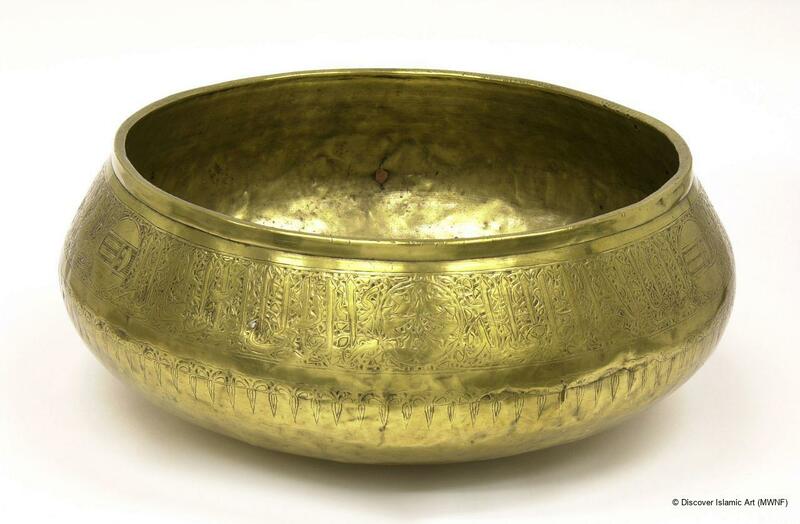 A brass water-basin originally inlayed with silver and divided into six sections with the aid of six roundels. 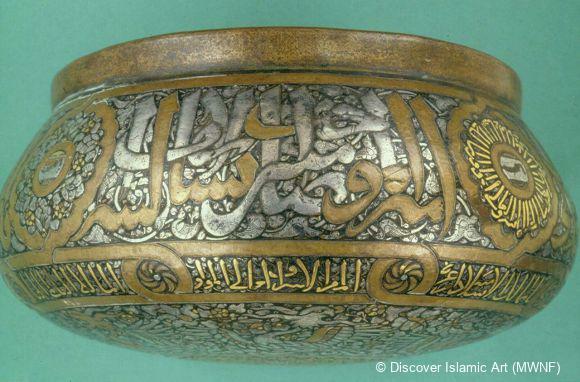 Decorated with a band of bold calligraphic inscription, the text reads: 'This is one of the things made for his highness, the lordly, the kingly, the learned, the treasure house of excellence, the just, the conqueror, the warrior, the defender, the protector of frontiers, the fortified by God, the victorious, the planner, the well-ordered, the masterful, the complete, supporter of the khan, the Seal Bearer, the king the Nassiri.' The inscription indicates an official of high rank in charge of the Sultan Al-Malik Al-Nasir's correspondence and other administrative responsibilities. 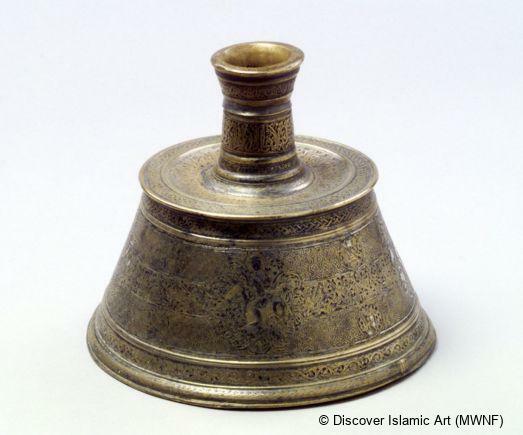 Al-Malik Al-Nasir (who ruled during three phases between AH 692 and 740 / AD 1293 and 1340) commissioned the basin. Three of the roundels enclose the design of a blazon. The other three roundels have a symmetrical composition of six birds: two facing each other, two looking away from each other; and two moving away from each other but looking back at each other. The compositions of these roundels with their birds or waterfowl are a distinctive feature of Egyptian Mamluk metalwork, distinguishing it from contemporary Syrian, Iraqi and Iranian work. Vessels like this one were quite expensive. 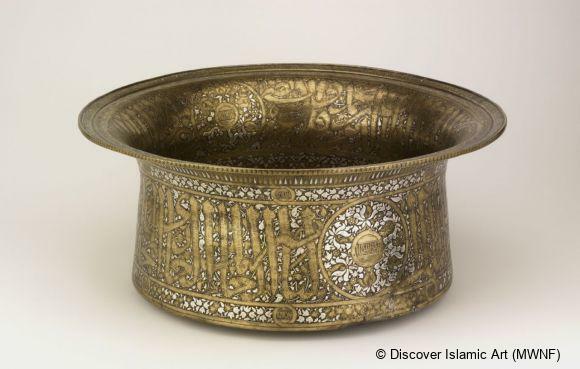 The script round the basin is in the thuluth style, and describes the titles of the high-ranking Mamluk official who owned it. 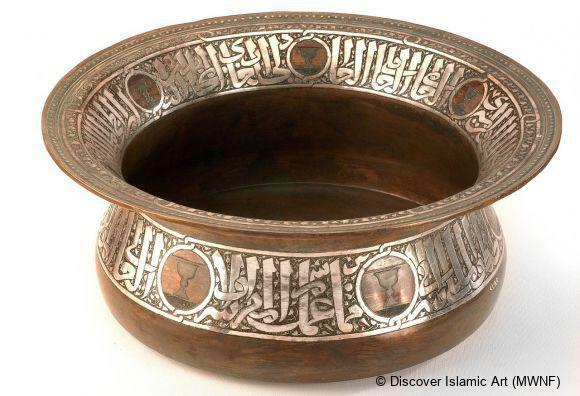 The blazon incised in the roundels that divide the text indicates that the owner was in charge of the sultan’s correspondence. Artistic analysis together with identification of the 8th- / 14th-century Mamluk blazon and titles. Purchased by the Museum in 1907. 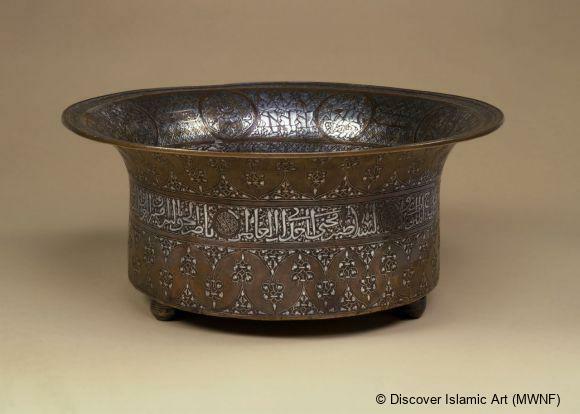 Identification of the 8th- / 14th-century Mamluk blazon and titles. 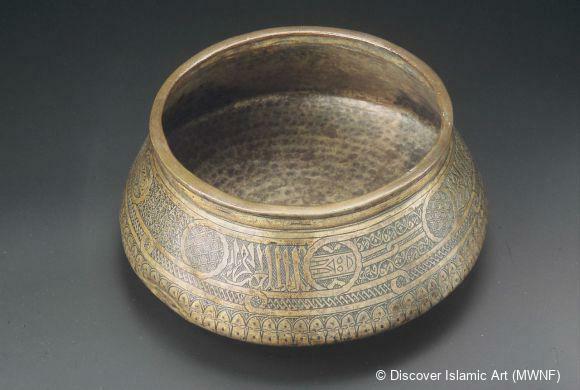 Allan, J. W., Islamic Inscriptions, Edinburgh, 1998. Blair, S. S., and Bloom, J. M., The Art and Architecture of Islam 1250–1800, Yale University Press, 1994. 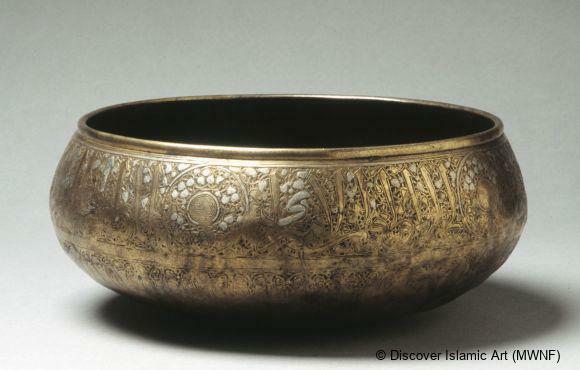 Ward, R., Islamic Metalwork, London, 1993. 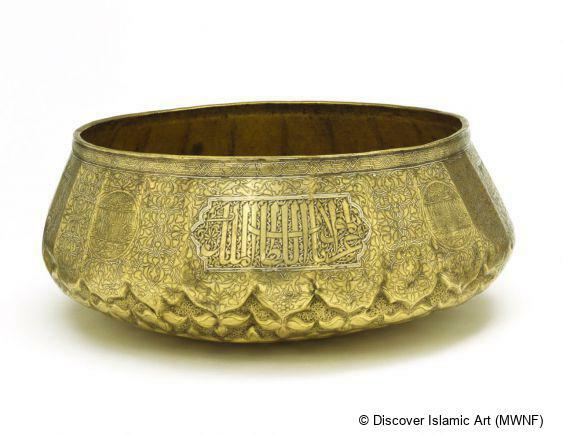 Noorah Al-Gailani is Curator for Islamic Civilisations at Glasgow Museums, Scotland. With a BA in Interior Design from the College of Fine Arts, Baghdad University and three years' experience in design and folk art preservation, she moved to the UK in 1992. On completing her MA in Museum Studies at the Institute of Archaeology, University College London in 1994, she worked as Project Officer at the Grange Museum of Community History documenting the presence of Muslim communities in the London Borough of Brent. In 1995 she was Assistant Curator, Ancient Monuments Laboratory, English Heritage, and in 1996 became Curator for John Wesley's House and the Museum of Methodism in London. She co-authored The Islamic Year: Surahs, Stories and Celebrations (Stroud: Hawthorn Press, 2002) for non-Muslim children. 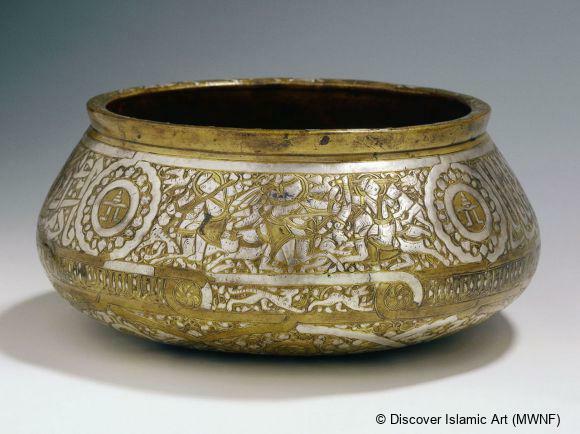 Since 2003 she has been based at The Burrell Collection in Glasgow, working across the city's museums to interpret Islamic art and culture, ancient and modern, through research, exhibitions and educational activities.